Our pediatric hearing specialists provide a wide range of rehabilitative services to address hearing problems. We strive to identify hearing loss at the earliest stages and reverse or lessen it. We offer a comprehensive audiology treatment program for infants, children and young adults with mild to profound hearing loss, including hearing loss caused by exposure to extremely loud noise. 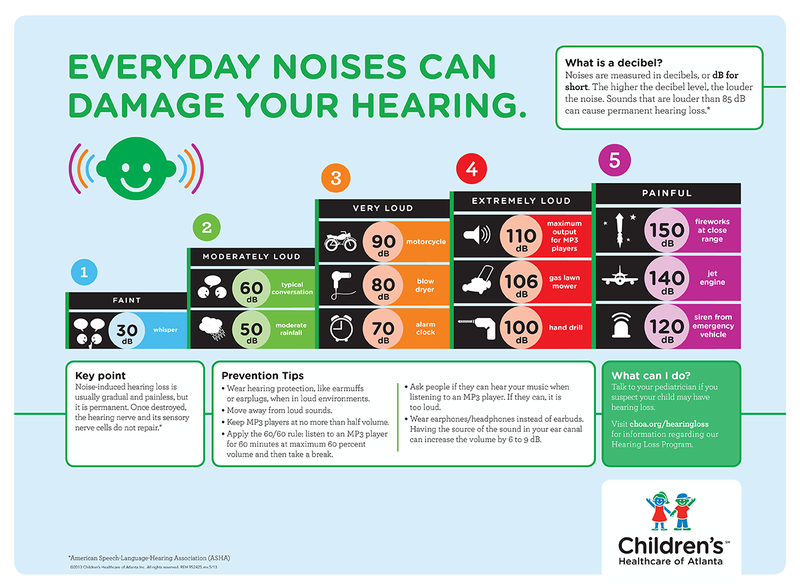 You can prevent hearing damage caused by everyday noises. 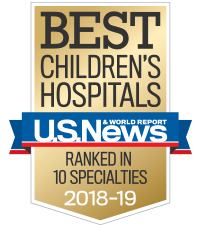 Our pediatric otolaryngologists (ear, nose and throat doctors, or ENTs), audiologists (hearing specialists) and therapists offer a full range of audiology diagnostics and treatment services to create integrated, comprehensive care that’s unmatched at other children’s facilities. We use a variety of methods to find the source of a child’s hearing problem and treat it properly. Additionally, we routinely assess children scheduled for speech-language evaluations to determine if hearing is an underlying factor in a child’s speech and language difficulties. Behavioral hearing evaluation: A hearing assessment that’s adapted to your child’s age and development level (may begin as young as 6 months). Auditory brainstem response (ABR): An auditory nerve function assessment used for infants, young children or those who can’t be assessed reliably with a behavioral evaluation. Newborn hearing screening: An assessment that’s part of national and state initiatives to identify potential hearing difficulties in newborns. Middle ear evaluation: An assessment of the eardrum and middle ear muscle reflexes. Otoacoustic emission testing: An assessment of the cochlea, the hearing organ in the inner ear. Hearing aids: We match children with the appropriate state-of-the-art, digital hearing technology through our hearing-aid evaluation process. Our audiologists also provide fitting and maintenance services. Bone-conduction and bone-anchored hearing aids: These hearing aids are used for children who can’t use traditional hearing aids. We provide fitting, programming and follow-up services for these specialized devices. FM systems and assistive listening devices: Some children may benefit from devices that improve their hearing in challenging listening situations, such as in the classroom. Our audiologists can test your child to see if he may benefit from these devices. Cochlear implant services: We offer cochlear implantation—an electronic medical device that replaces the function of the damaged inner ear—for profoundly deaf patients. Our audiologists provide assessment, programming and follow-up care for the implant after surgery. Auditory-Verbal Therapy is a spoken-language approach that helps children make the most effective use of hearing devices and residual sound. It relies upon hearing, rather than seeing or touching, as the primary sense for gathering information. About 3 in 1,000 babies are born with hearing loss. In most of those cases, there are no other medical conditions and no family history of hearing loss. Most of these hearing problems are identified during a newborn hearing screening in the hospital before the baby goes home. This pain-free assessment allows us to begin treatment as early as possible to stimulate sound in your baby’s brain. If your baby doesn’t pass the initial screening, you’ll receive a referral for a second screening within the first month. Depending on the results, you may need to schedule additional evaluations with an audiologist, who will determine whether your child has hearing loss and should see an otolaryngologist (ENT). Your child’s ENT doctor can determine the cause and treatment of the hearing loss. Following your doctor’s recommendations, our specialists can help determine which additional evaluations and treatments may be necessary. Children’s audiologists have extensive experience in pediatric hearing evaluations on young patients exhibiting a variety of symptoms, conditions and complications. In 2014 alone, we performed 1,303 ABR evaluations and newborn screenings and had more than 13,500 audiology encounters. Since we work exclusively with kids, this experience gives our audiologists a keen eye when interpreting results. In 2014, we performed 69 pediatric cochlear implant surgeries, totaling more than 75 percent of all implantations in Georgia. But getting the implant is just the beginning of your child’s journey through hearing loss. That’s why we offer a comprehensive approach to implantation. Our multidisciplinary team works together, and with your family, to specialize your child’s care. Children’s is one of the only pediatric hospital systems in the Southeast that provides vestibular rehabilitation. See—and hear—about our Hearing Loss Program.